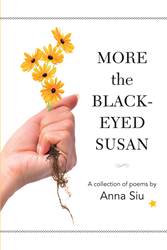 Recent release “More the Black-Eyed Susan” from Page Publishing author Anna Siu is a page-turning book containing poems of surreal moments and propounding philosophies. Anna Siu, a gifted first-generation American of an immigrant family from China, has completed her new book “More the Black-Eyed Susan”: a heartwarming book filled with allegorical proses that depict meandering human circumstances. Published by New York City-based Page Publishing, Anna Siu’s opus entails a wide knowledge of vocabulary for an in-depth understanding of life’s enigmatic nature. Readers who wish to experience this magnanimous work can purchase“More the Black-Eyed Susan” at bookstores everywhere, or online at the Apple iTunes store, Amazon, Google Play, or Barnes and Noble.